For me, this was the most poignant souvenir of Kevin’s visits to America in the 1990s and 2000. I could hardly breathe when I held this piece of paper in my hands for the first time. 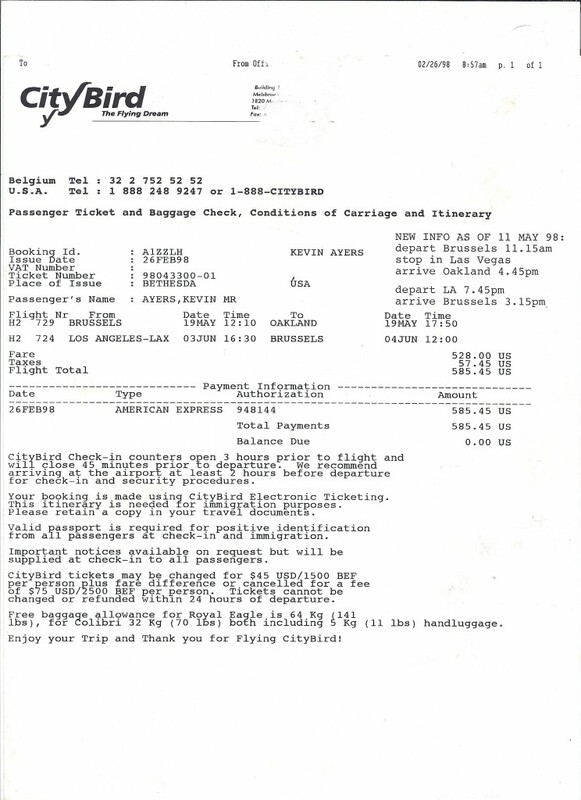 It’s Kevin’s flight details from May 1998. “Passenger’s name : AYERS, KEVIN MR”. It seemed to sum up the excitement and anticipation of any trip abroad, with the added frisson of live performances to come. Richard Derrick and his friends had invited Kevin to play a series of gigs in California; they organised venues, backing bands, transport and invited Kevin to stay in their own homes. This allowed Kevin, the wandering troubadour, to be himself. Seven songs from the concert on May 29th 1998 at The Gig, Los Angeles, appear on the ‘Alive in California‘ album, including a haunting version of ‘Ghost Train’ and a very jaunty ‘Stranger in Blue Suede Shoes’. Having done a fair bit of research about Kevin’s attempts to break through to the American audience in the early 1980s, whilst I was gathering info for the re-release of ‘Diamond Jack and the Queen of Pain‘, I can imagine how much Kevin relished the opportunity to finally perform his songs to appreciative audiences in California during the 1990s and September 2000. Thanks again to Richard Derrick for sending us such wonderful souvenirs.